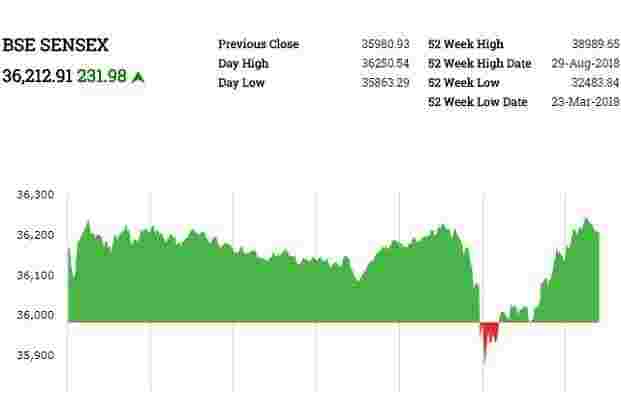 The BSE Sensex closed 231.98 points, or 0.64%, up at 36,212.91, and the Nifty 50 ended 53 points, or 0.49%, higher at 10,855.15. IndusInd Bank reported a 4.6% rise in its December-quarter net profit due to higher provisions and contingencies. 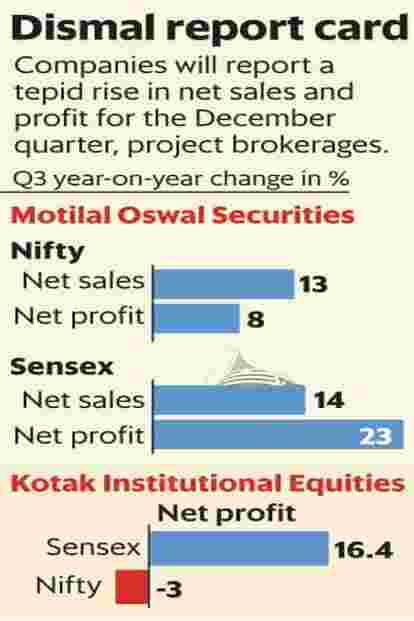 Net profit for the quarter stood at Rs 985.03 crore against Rs 936.25 crore a year ago. 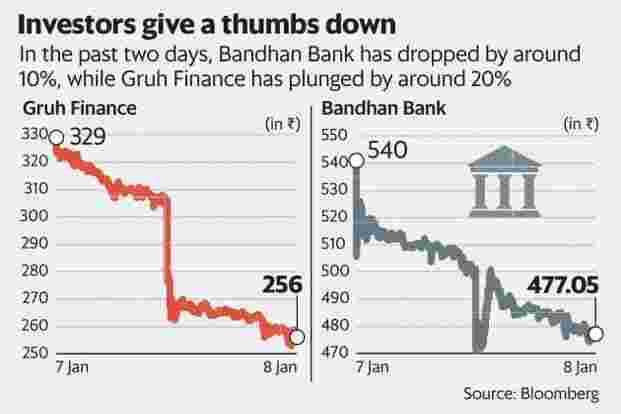 According to Bloomberg estimates, the lender was expected to post a profit of Rs 810.50 crore.Net interest income (NII), or the core income a bank earns by giving loans, was up 20.76% to Rs2288.09 crore versus Rs1894.81 crore last year. Other income was at Rs1468.85 crore, up 23.77% from Rs1186.76 crore a year ago.Provisions and contingencies surged 156.89% to Rs606.68 crore in the quarter from Rs236.16 crore a year ago. On a quarter-on-quarter basis, it rose marginally 2.78% from Rs590.27 crore. Tera Software Ltd said it has bagged a work order worth Rs 324.89 crore from Andhra Pradesh State FiberNet Limited to establish optical fibre grid network in 3394 Gram Panchayats in the state. Tera Software shares surged 19.90% to Rs 50.30 per share. Will TCS be the best performing Sensex stock in 2019? NMDC Ltd shares traded 3.9% lower at Rs 91.20 per share after the company approved the proposal to buyback of upto 102,040,815 equity shares, representing 3.23% of the total shares, at a price of Rs 98 per share for an aggregate consideration of Rs 1,000 crore. Tata Steel shares rose over 1% in the opening trade, but soon the stock fell as much as 2.43% to Rs 479.40 per share. Tata Steel said on Tuesday lower production in Europe will impact its financial results, ahead of a planned merger with Germany’s Thyssenkrupp. Production from its European plants fell 12.7% to 2.33 million tonnes for the third quarter ended December 31. Shutdowns and operational issues at IJmuiden plant in the Netherlands and Port Talbot in Wales hurt the company’s performance in the quarter, Tata Steel said. Tata Motors shares jumped as much as 1.6% to Rs 182.75 per share. The company’s UK subsidiary Jaguar Land Rover reported a 16.23% increase in its sales in India in 2018 at 4,596 units in 2018, compared to 3,954 units in 2017. The sales volume achieved in 2018 was the highest in a calendar year for the company. The sales were driven by models such as Land Rover Discovery Sport, Range Rover Evoque, Jaguar F-Pace, XE and XF, it added. Yes Bank shares traded 0.83% lower at Rs 190.70 per share, Intraday, the stock fell as much as 1.19% to Rs 190 per share. It hit a high of 193.95 per share. The bank’s board will meet today to decide on the appointment of a new CEO. Infosys shares rose as much as 2.8% to Rs 688.70 per share after the IT company said it will consider proposals for share buyback and special dividend during its board meeting on January 11. The Indian rupee strengthened marginally against the US dollar, tracking gains in Asian markets as increasing optimism the US and China will be able to defuse their trade war outweighed a worsening global growth outlook. At 9.10am, the rupee was trading at 70.13 a dollar, up 0.09% from previous close of 70.20. The home currency opened at 70.06 a dollar. The 10-year bond yield was trading at 7.53% from its Tuesday’s close of 7.532%. 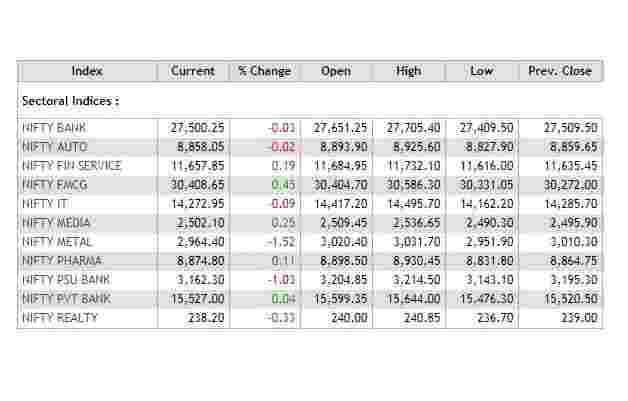 On Tuesday, FIIs sold shares worth 553.78 crore on net basis, while DIIs bought equities to the tune of Rs 698.17 crore, according to provisional data from NSE.